One of the most authentic culinary experiences in Croatia! Youthful and enthusiastic winemaker Mario Bartulović, from Prizdrina on Pelješac peninsula, welcomes you to Dubrovnik’s wine empire with a stellar journey through peninsula’s golden traditions – memorable wines and a life-long lesson on peka making! Mario’s family has been living on Pelješac for over 5 centuries, hence there might not be a better person to give you a first-hand account of the livelihood in the area. Painting the story of the peninsula's famous wines, Mario will take you to its two representative wine cellars. First, it's the Napa Valley’s favourite Croat Mike Grgich’s cellar, and then his own - Bartulović, growing grapes at 16 different positions in the peninsula. Savouring two different takes on the same local varieties, like Rukatac and Pošip whites, and Plavac Mali reds, will illustrate the incredible character of these sorts, but also an immense role that the individual wine maker’s approach plays for the final product. But you will fully grasp the inspiring potential of this region once you embark on the adventure of preparing meat under peka! 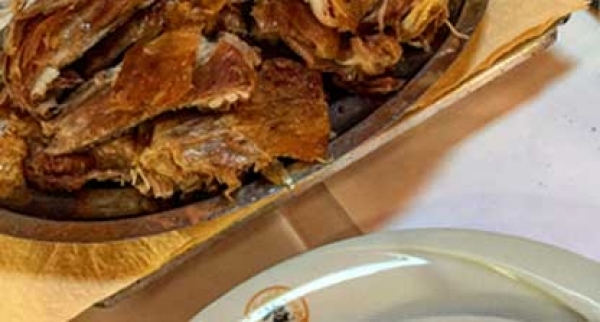 Peka is an iron bell, which is placed over a pan with pieces of meat, traditionally veal or lamb, and potatoes, and then covered in hot charcoal. Leaving food to simultaneously cook and bake over several hours, peka blends aromas, flavors and a hint of ancient into a wonderous meal. Under Mario’s guidance, you will master the secrets behind this seemingly simple art, enjoying the final result as the ultimate compliment to the local wines. With much rave about its oysters, mussels and wine, Pelješac may seem like it’s all about indulgence. If you please, however, Croatia’s second largest peninsula will make you work for your lunch: a walk on the ancient walls of Ston brims with fantastic panoramas of its historic saltpans; Napoleon’s trail is a beautiful hiking scenery through untouched nature, and Viganj, almost at the tip of peninsula, awaits windsurfers with some of the best winds in Croatia! Authentic cooking of the Dalmatian hinterland!